As you add items to your cart they will show up here! 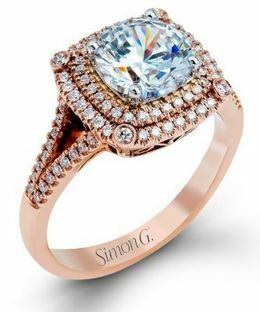 Simon G. Designer Wedding Bands, Diamond Engagement Rings, and Fine Designer Jewelry for Men and Women. 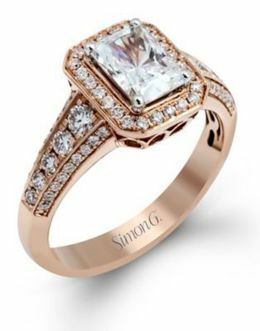 Romantic Vintage Engagement Ring By Simon G.
About Simon G. Designer Wedding Bands, Diamond Engagement Rings, and Fine Designer Jewelry for Men and Women. 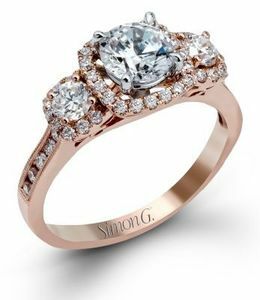 Designer Simon G’s Engagement Rings, Wedding Bands and Bridal Sets for Men and Women. 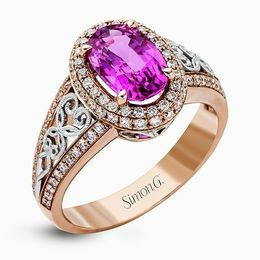 Simon G Jewelry is Exceptionally Designed of Gold, Glittering Diamond and Precious Gemstone Fine-Quality Jewelry in Ageless, Elegant Styles. Every Precious Simon G. diamond ring, engagement ring, wedding band, bridal set or select fine jewel is created by meticulous artists to enhance the brilliance of each stone for maximum sparkle and shine. “If you want jewelry that is stared at, you can’t afford to overlook anything.” These are the words of Designer Simon G (Ghanimian) True artistry is revealed in impeccable perfection as every detail in every piece of Simon G Designer jewelry is crafted with creative flare. 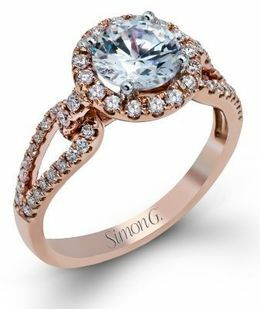 The color and clarity of each diamond is set to match for consistent, alluring, color and every part of the jewelry’s craftsmanship is meticulously detailed and polished by Simon G’s jewelry designers right here in the U.S.A. 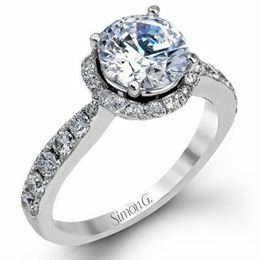 Present an Extraordinary Simon G Diamond Engagement Ring to Your Intended. 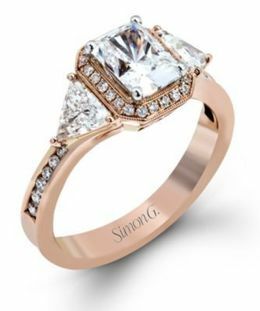 Designer Simon G provides superior quality jewelry attracts great admiration and expresses your highest esteem when you present a Simon G Engagement Ring to your loved one. Small details make the big differences as proven in the many admirers of these stunning American made diamond rings, bands and fine jewelry. Complicated beadwork, lacey filigree, and intricate engraving. Are some of the sweet details of a Simon G unique diamond engagement ring and bridal set. 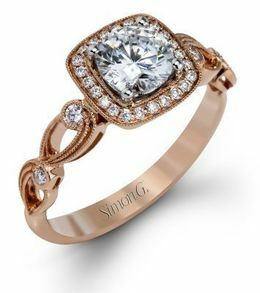 Simon G Designer fine jewelry pieces are created by families for families. 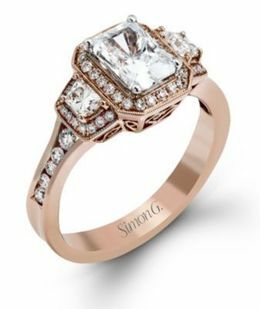 Simon G provides superior quality and craftsmanship in every piece of jewelry they design in their American jewelry studio. 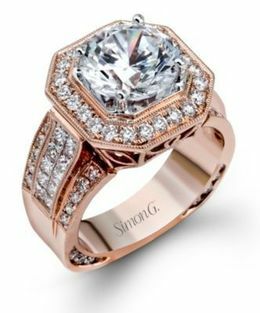 The sparkling diamonds and precious genuine gemstones of every hand-set Simon G engagement ring, wedding band, or fine jewelry piece is inspected under microscopes by Simon G’s seasoned artisans. The diamonds are securely fastened and securely set. Be confident your diamond is well mounted to brilliantly reflect the light and fire of your diamonds and gemstones. 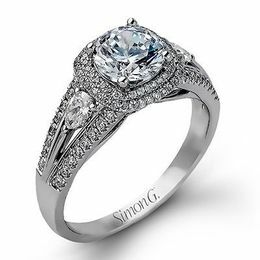 Simon G Designer Diamond Rings, Engagement Rings and Diamond Bands. * Wedding Bands in Gleaming Gold Textures add Polish for Your Handsome Groom..
* Glowing Yellow Gold, Sleek White Gold and Platinum or Romantic Rose Gold. 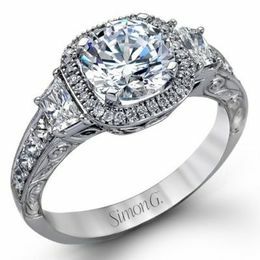 * Engagement Rings and Wedding Bands from Simon G Designers Traditional to Extravagant Styles. * Diamonds and Lacey Filigree Engagement Rings Crafted to show off White Diamonds with Maximum Glitter and Shine. 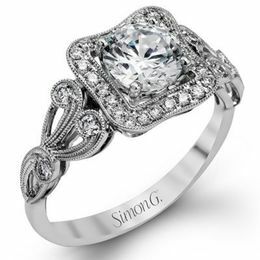 * Simon G Designer Rings are Dripping in Sparkling Diamonds and Wrapped in Feminine Scroll Designs. 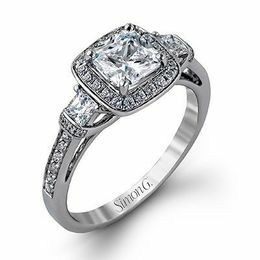 * The Enchanting Details are What Make Simon G Diamond Engagement Rings and Bands Highly Desirable. With designer engagement rings and bands to match your bride or groom's unique style, Simon G. has sophisticated wedding, anniversary, eternity bands and rings created in superb craftsmanship. View all the collections here and find the style that expresses who you are. Choose a sleek look, or a more traditional style ring in platinum, 14k or 18k white, yellow or rose gold. 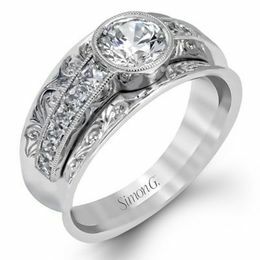 Many of our Simon G wedding bands feature beautiful diamonds set in patterns around the band. 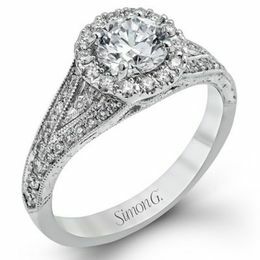 Simon G Designs offer the Most Stunning Women's Bridal sets that are Dripping in Diamonds, Diamond Engagement Rings. Sparkling Men's Rings and Contemporary, Classic Wedding Band Designs for the Bride and Groom. Give a Ring to the Gallant Man in Your Life an Esteemed Gift of a Rich Gold Band Designed Magnificently by Simon G.
Gents love fine objects too and Simon G has a line of men’s wedding bands and rings to satisfy every man. If your guy is a dapper dresser or the most relaxed and understated man, Simon G’s artisans have the perfect ring. Created with golden heft and designed for a comfortable fit, these Simon G wedding bands and fashion rings are worth the investment. *Glitzy Diamonds Set in Two-Tone Gold and Platinum Gentlemen’s Rings and Bands. * Simon G offers Satiny Matte Finishes of Platinum and White Gold Bands for Men. * Textured, Hammered and Etched Finishes make for Rugged Tasteful Men’s Rings. * For the Dapper Gent, Two-Tone Yellow, Rose Gold and White Gold Designer Polished Bands. * Absolutely Handsome Layers of Gold and Diamonds on Powerful Rings for Men from Simon G Designers. * Simon G Designer Rings for Men created with comfortable fit. * Large and Small Sizes to Order. Simon G Bands and Rings for Men are Generously Created to Fit Comfortably On the Hand. Our top-shelf collection of bands and rings designed by the Simon G family offer comfort and class for the true gentleman. Every texture and diamond are hand set and engraved to present maximum glitter and luster. Men’s wedding band styles have handsome details such as: hammered, brushed gold, polished gold, rose gold, platinum, white diamonds and diamond wraps, two tone combination wedding bands in polished and brushed or textured styles. Simon G men’s rings are available in 18k gold, 14k gold and platinum. Unique and traditional, classic designs and ring sizes to comfortably fit every man’s finger and style. A Simon G man’s ring is a satisfying investment in a wedding band you plan to wear forever. Say How Much You Admire and Treasure That Special Someone, Give the Gift of Simon G Designer Jewelry. Browse our Simon G Designer Jewelry Collections and Celebrate all of Life’s Special Occasions with Superb Taste. Designer Diamond Rings, Simon G Diamond Wedding Rings, Diamond Anniversary Bands, Sparkling Precious Gemstone Earrings, Glimmering Necklaces and Glossy Jewels are the Traditional Special Occasion Gifts that make Memories of a Lifetime. 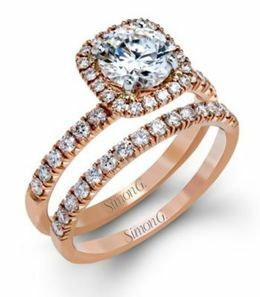 As you browse the lovely Simon G Designer Jewelry collections here at Kranich’s Jewelers, keep in mind our experienced staff is here to help with your selections, fittings, and we offer financing options to those who qualify. Simon G Designer Jewelry is the Perfect Gift for Every Special Occasion. A Forever Gift to Give. 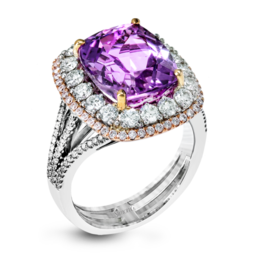 Present Simon G Designer Jewelry of Sparkling Diamonds or Gemstones, to the People Who add Sparkle to Your Life. Explore the delicate beauty of a Simon G Diamond Anniversary Band to Celebrate Your Enduring Love. People are attracted to lustrous jewels and glittering diamonds and gemstones. Give the gift of Simon G. jewels to celebrate marriage, with a diamond engagement ring and wedding band. Select the piece de resistance, a special occasion gift of: gleaming gold earrings, sparkling gemstone bracelets, or stunning necklaces for life’s moments. 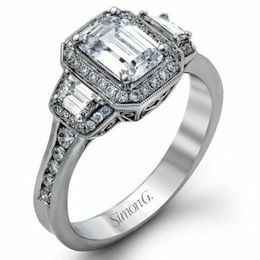 Committed to the highest standards in jewelry design Simon G fine jewelry designers are magnificent. 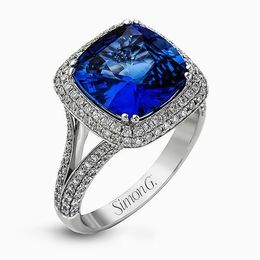 When you are presenting the gift of unique and forever diamonds or jewelry from Simon G you can be confident that wonderful memory will last your lifetime. Diamond and precious yellow gold, white gold, rose gold and platinum wedding bands are designed with great care by the artisan’s at Simon G studios here in the good old USA. A Simon G. A diamond band is the perfect symbol of everlasting love and an impeccable gift to present for memorable anniversary celebrations. 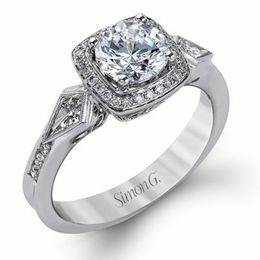 Simon G diamond engagement rings, wedding bands and bridal collections, are crafted with love. Every bracelet, earring and pendant are each designed at Simon G to be individual works of art. 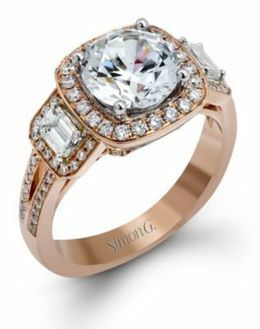 See Our Brilliant Simon G. Jewelry and Wedding Ring Collections! Visit Kranich's Jewelers Today! >Call 888-944-4575 if you want to speak to one of our helpful experts. Financing of Your Jewelry, Engagement Ring and Wedding Bands is available to those who qualify.